Remember when 'Microsoft Surface' was a bar table? 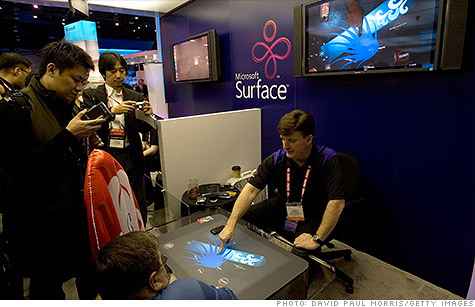 The original Microsoft Surface, pictured here during demos at CES in 2008, was a 30-inch touchscreen tabletop. Now it's been rebranded as "PixelSense." NEW YORK (CNNMoney) -- Microsoft's long-in-the-works tablet has finally been unveiled, and it's called "Surface." Does the Microsoft Surface name sound familiar? It should. The original Microsoft (MSFT, Fortune 500) Surface, unveiled in 2007, was a 30-inch touchscreen tabletop. That device popped up in hotels and bars, and it let users interact with both digital items and physical objects through the use of infrared cameras. With the Monday debut of the Surface tablet, though, the original tabletop product has been renamed "PixelSense." That was already Microsoft's name for the underlying technology that helps power the tabletop product. Microsoft Surface 1.0 lets users pull up video clips and swipe through photos -- plus, they can tag and interact with real objects like phones. Popular Mechanics called it "a coffee table that will change the world." But at about $10,000 a pop, Surface 1.0 wasn't priced for regular old coffee tables. Instead, companies like hotel and bar chains bought in. AT&T (T, Fortune 500) deployed the Surface in several of its retail stores to help show off its phones and mobile devices. The Surface 1.0 lived for three years before a new model took over in 2011: the Samsung SUR40. That next-gen model got a price cut, retailing at $8,400, and comes with improved specs like a 40-inch touchscreen. But you won't find many traces of it left on Microsoft's website. Microsoft's Surface page is now a tablet brochure, with a teeny fine-print note at the bottom: "Looking for the Samsung SUR40 with Microsoft Pixelsense? Visit www.pixelsense.com."